When you create a live stream with a YouTube social account, we create a new event on YouTube for every stream. Click Live Control Room button next to your event. If you do not have any existing events or want to create a new one just click the New live event button at the top right. Scroll down and you will see the Ingestion settings for your event. Copy Stream Name to Stream Key in OneStream custom RTMP account settings. 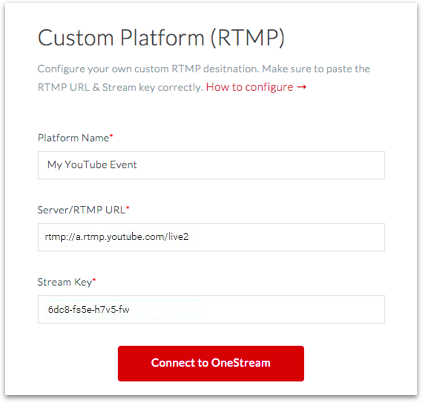 Copy Primary Server URL to Server/RTMP URL in OneStream custom RTMP account settings. The Platform Name can be anything you want. Schedule a new Stream and choose this custom RTMP social account as your destination. Once the live stream starts, you need to click Go Live from YouTube live control room. The downside of this approach is that you have to be present on your computer and manually click Go Live from within YouTube event live control room. Otherwise viewers will not see it.